Burgers can be healthy… if they’re made from vegetables. Think making veggie burgers from scratch is long, hard work? Think again. From start to finish it may take a little time, but the work is easy, and if you plan in advance, you’ll be pan-searing your way to healthy burger-y goodness in no time. This particular veggie burger (pictured above) was one of our crown achievements. 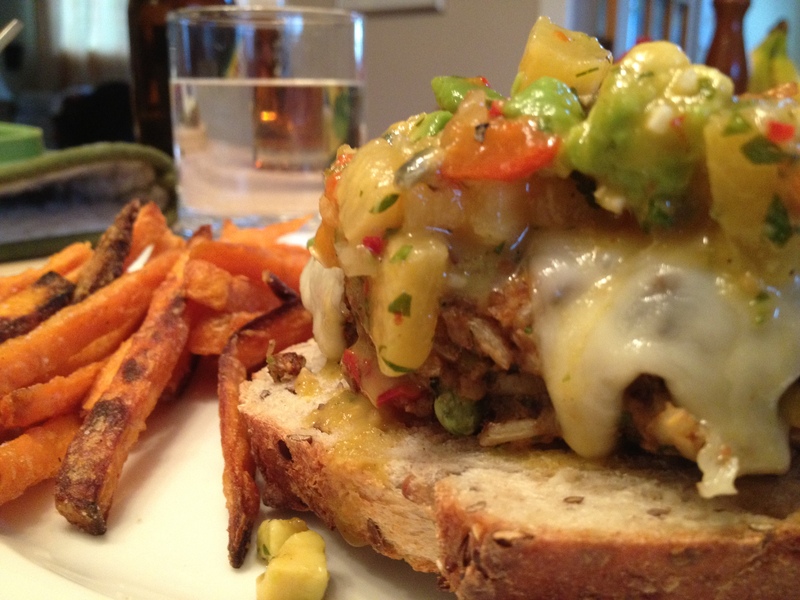 Topped with melted Jarlsberg cheese and mango-avocado salsa. Don’t let the glass of water in the background fool you – we were probably drinking wine. We’re not that healthy. The photos below show the making of another veggie burger, almost identical to this one, except I was so hungry when we finished, I forgot to take a photo. My first piece of advice: make some brown rice, and cook the beets, the night before. These two ingredients are the only seriously time-consuming elements of the process, but, if you throw some on the night before and stick them in the fridge, you’ll be good to go. 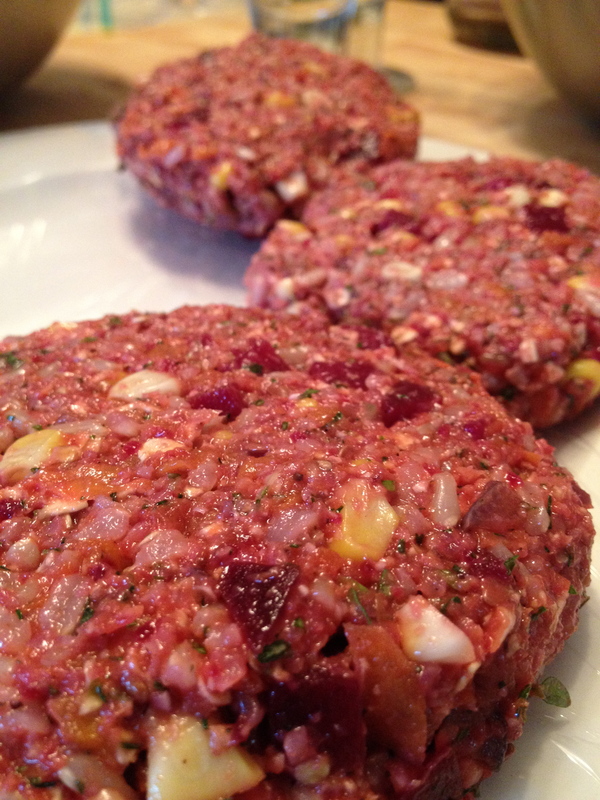 Plus, the beets make the burgers a pretty pink colour! 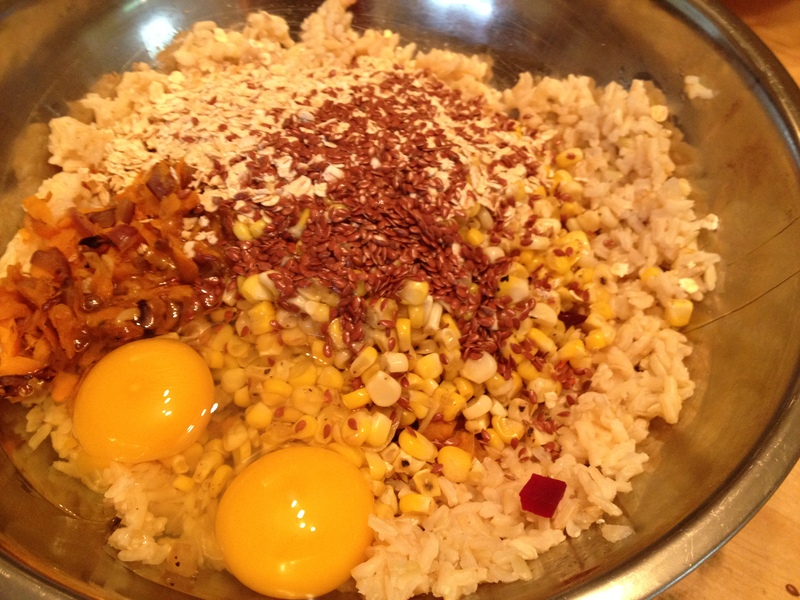 You can really use whatever ingredients you fancy, but as you’ll notice above, we used corn (freshly-seared or frozen works), red onion, sweet potato and brown rice. 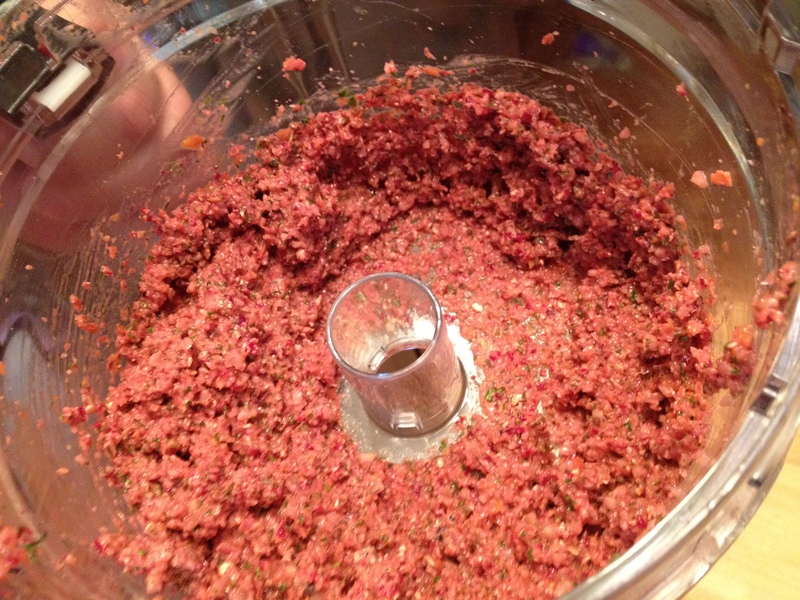 Also, as pictured in the gallery: beets, garlic, and sun-dried tomatoes. 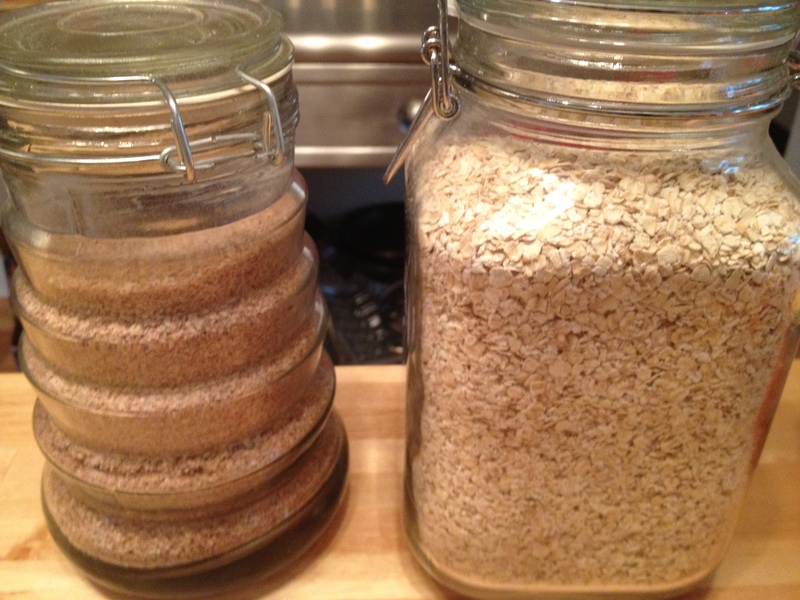 Important for proper binding, we use some rolled oats, as well as wheat germ. We haven’t strayed into vital wheat gluten territory yet, although I’ve heard that stuff binds them together like crazy. Throw some egg in, along with some flax seed, and call it a day. Now it’s time to get your hands dirty. Or, a spoon will work too. 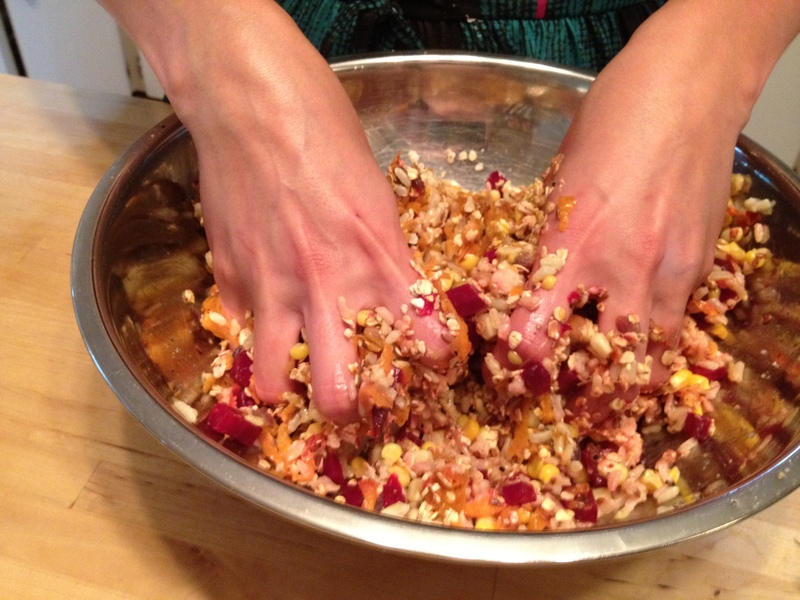 Here I am mixing up the veggie burgers. What we do, for the consistency that we enjoy, is to throw half the mixture into the food processor, and the other half stays like this. 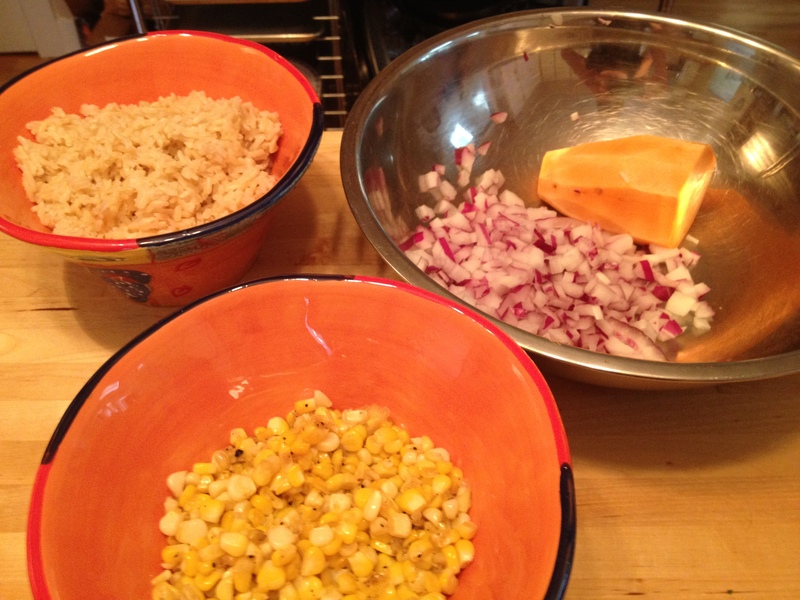 Then we mix the two together… so it’s not too chunky. 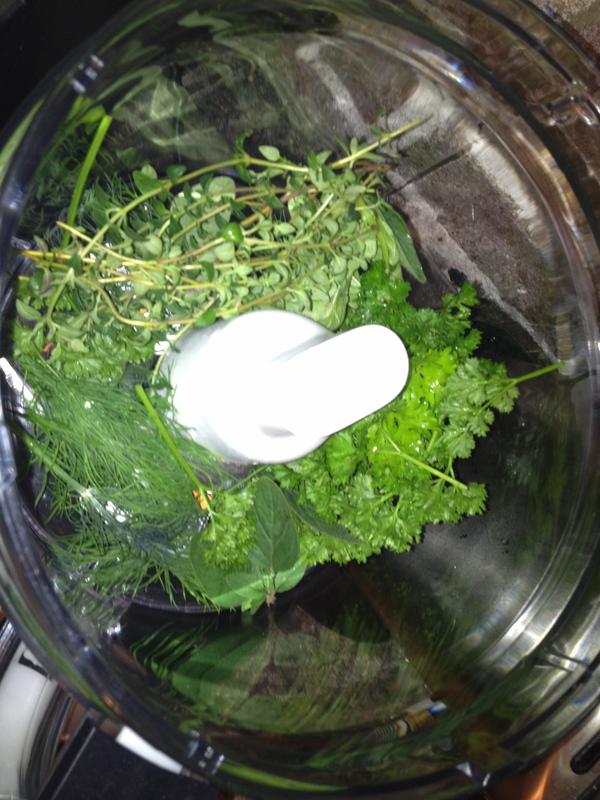 Of course you also need a glorious amount of freshly cut herbs, from your back deck, like we have here. Or… pick some up at the market. Here are some formed burgers. After this, we throw them in the fridge for just a little bit, to firm up. Maybe twenty minutes. If you’re a keener, make them the day before and they’ll be perfect for cooking the next night for dinner. Our weapon of choice is the flat-top pan we have for on the BBQ. These babies won’t really grill on the regular surface of the BBQ because they are a tad too unstable, but, if you put some oil on the flat-top or even just a frying pan, you can crisp them up nice and good! Make sure to cook them through, because there’s raw egg in there. A couple notes: we’ve learned not to use peppers in our veggie burgers because there’s too much moisture. 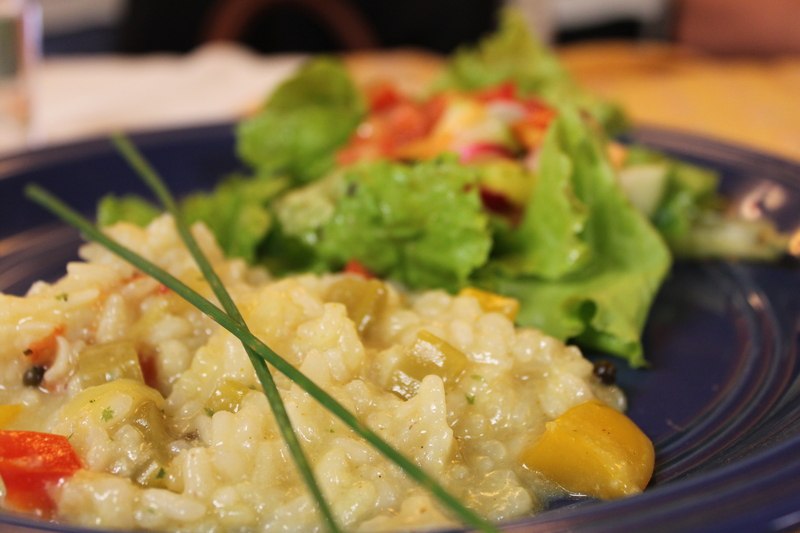 And… peas are really nice, we just didn’t include them on this particular occasion. Toast some nice bread or a bun, top with your favourite cheese (melted), caramelized onions, fried mushrooms, some mustard, salsa or other topping and enjoy. If you’re not a vegetarian and eating veggie burgers – feel free to throw on some bacon. It’s really good. Geir and I were lucky enough to attend a dinner at the North End Community Health Centre last week. This resulted from an impromptu invitation from Local Connections magazine owner, Alex Henden, with whom we sat at the dinner. His wife and daughter accompanied him – and the five of us were surprised and touched by what we experienced that night. We learned about Hope Blooms, which is a community food bank-esque project in the north end of Halifax. The program is more than just about giving food to families who need it, though, it’s about teaching children responsibility, purpose, hard work, healthy eating, accountability and, of course, hope. A group of children work, under the guidance of some project leaders from the North End Community Health Centre, to tend to a communal neighbourhood garden. You may have seen it before while driving on Brunswick street, near what is known as Uniacke Square; the area is actually called Warrington Park. This has been going on for five years. Along with character and skill development for the at-risk youth who tend to the garden, and using ingredients from the garden for community dinners, in 2010 Hope Blooms began producing salad dressings. These are sold at the Seaport Farmers’ Market and through other channels. The last two years they’ve sold out of product within the first week. The reason for the community dinner last week was to host Catherine from Community Food Centres Canada – a member of the deciding committee on which lucky community in Halifax may get a new food centre – to be exact. The volunteer chef was Drew Rudderham from Acton’s Grill and Cafe in Wolfville. 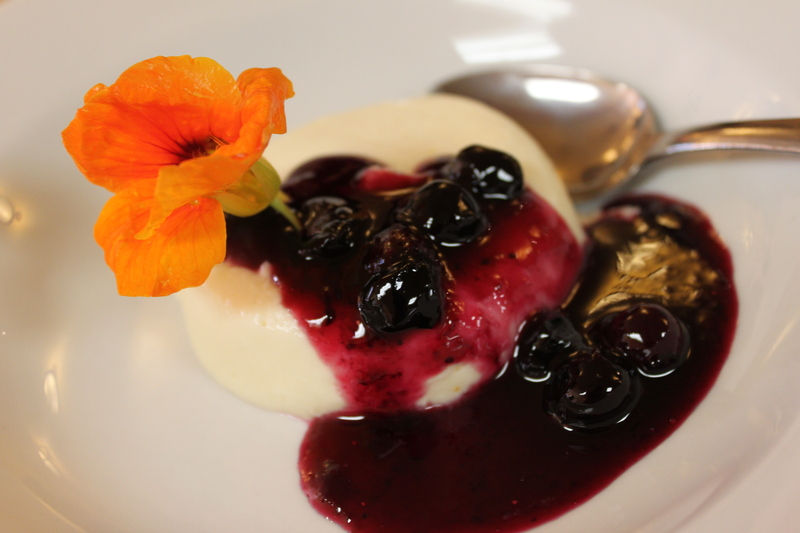 We had a lovely meal made from amazing produce from the Hope Blooms garden: Summer gazpacho, lobster risotto with salad, and blueberry panna cotta. We also had the pleasure of watching community members sing songs, see an art project be unveiled, and meet some junior leaders from the program. Keep an eye out for the next issue of Local Connections Halifax if you want to know even more!